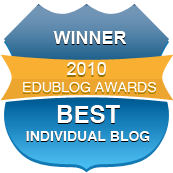 History of the Edublog Awards – Where did the Eddies come from? 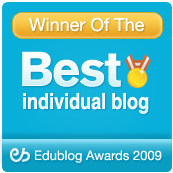 We’ve been asked to provide data about the Edublog Awards since it was started in 2004. How educational technology use has changed. Why the nomination, short listing and voting have changed. The Edublog Awards was set up in response to community concerns relating to how schools, districts and educational institutions were blocking access of learner and teacher sites for educational purposes. The purpose of the Edublog awards is promote and demonstrate the educational values of these social media. Creates a fabulous resource for educators to use for ideas on how social media is used in different contexts, with a range of different learners. Introduces us all to new sites that we might not have found if not for the awards process. Learners and educators still face difficult issues around network restrictions, around data protection and ownership, and around commercial protectionism. Lack of appreciation of the informal and formal educational value of user-centered applications. The Edublog awards continues to be a space for us to refocus the debate surrounding young peoples use of technology as irresponsible, dangerous or illegal, and look at the positive, powerful and transformative work which continues to be demonstrated. 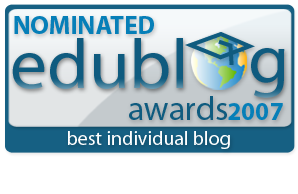 The Edublog Awards resources are gathered through a nomination process where anyone can nominate their favorite blogs and sites in a wide range of categories. The categories changed, and grown, considerably over the years. In 2004 and 2005 categories were for blogs only. By 2006, a lot had changed in the world of educational technology. The continuing rise and mainstreaming of easy to use online tools, and increasing access to the Internet in schools, lead to expansion of users of all ages creating and communicating online using a wider range of technologies. With this came the first non-blog category for Best Wiki use. And some of the categories from 2004 to 2007 are quite different from the categories we have today. By 2007, educators were using an even wider range of online tools while facing increase in hostility towards social networking sites and widespread lack of appreciation of the informal and formal educational value of user-centered applications. 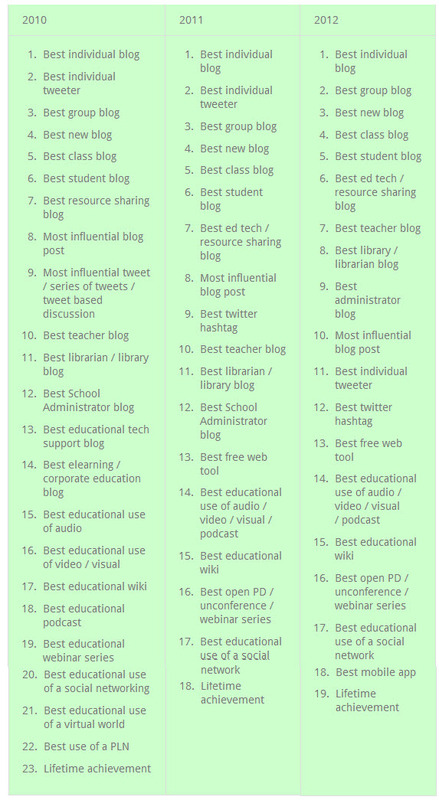 So the Edublog Awards categories were expanded to encompasses a wider range of online tools to showcase their educational value. By 2009, an increasing number of educators networking, connecting and supporting each other on Twitter which lead to the introduction of Twitter Categories: Best Tweeter and Most influential tweet / series of tweets / tweet based discussion (which evolved into Best Hashtag). By 2011, the number of categories decreased. The 23 categories in 2010 were too overwhelming for everyone, some of the less popular categories were combined while making way for some newer categories. With the increasing popularity of one-to-one tablets we introduced Best Mobile Apps as an unofficial category in 2011 which became a new category in 2012. The nomination process has changed over the years. Originally you could nominate by leaving a link to your favorite blogs on a comment on a post. In 2004, with 3-19 nominations per category, and only 10 categories, this was manageable. 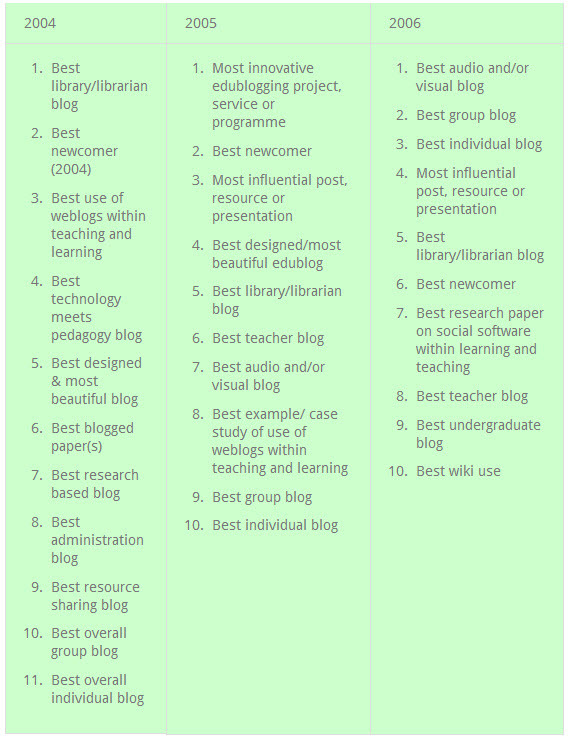 By 2009, the Edublog Awards had increased in popularity and the nomination process was changed to all nominations must be posted on a blog or a public website (such as a wiki or Ning). 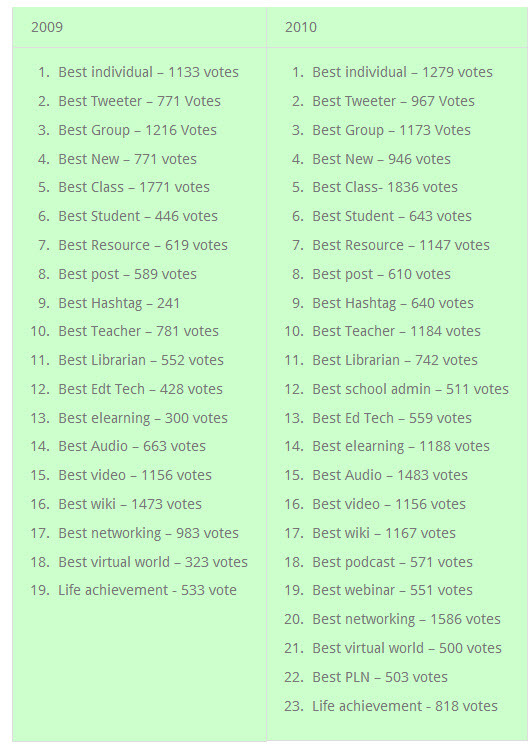 The reason for the change to public nominations is the Edublog Awards is about gathering and showcasing resources that help educators and students. Public nominations encourage people to reflect more on why they’re nominating particular blogs, websites or individuals. In 2010 there was over 400 nomination posts with some posts nominating in all 23 categories while in 2011 we processed 1814 nominated sites in 18 different categories. Whatever you do — you can’t win when it comes to the shortlisted nominations. 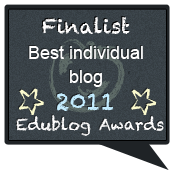 Shortlisting wasn’t necessary in the early years of the Edublog Awards. Life was easy in 2005 with 60 nominations in 10 categories. But it isn’t possible to list every single nomination in all categories when we now have some categories with over 80 different blogs, websites or individuals. Would love to know your thoughts? Should the maximum number per short list nomination be 30? Or do you feel we have a good compromise? The voting stage is where people can vote on their favorite blogs, sites or individuals. Which is why one vote per IP per category was introduced in 2007. It’s the only way to avoid rigging, to a degree. Voting has increased considerably from 2005 – where there was 60 edubloog nominations, in 10 categories and 3268 votes. Over the years we’ve had a range of nominated, runner up and winner badges. We are always looking to improve the awards to make them as valuable to the community as possible. Feel free to leave a comment below or contact us with any ideas or feedback you may have.